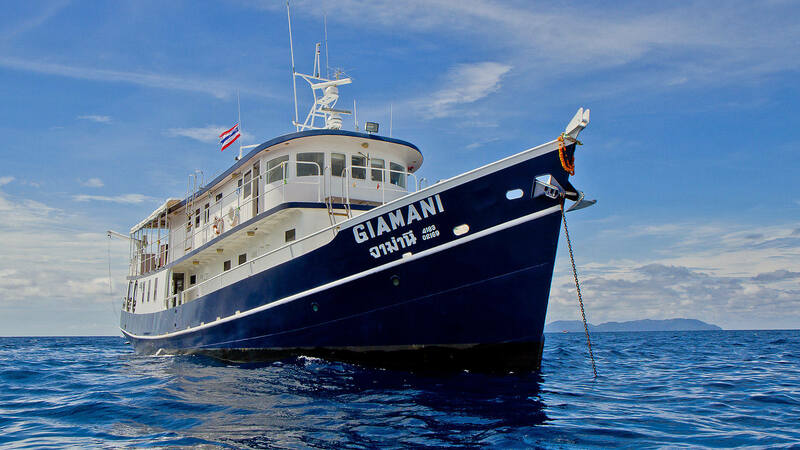 The Giamani is a higher class Thailand liveaboard offering 2, 4 and 6 day dive safaris to Hin Daeng, Hin Muang, the Similan Islands and Richelieu Rock. Plus some short 2 day summer trips to the Racha and Phi Phi Islands. The boat was built in 1998 to IMO standards, and she was carefully looked after by her Italian owner. 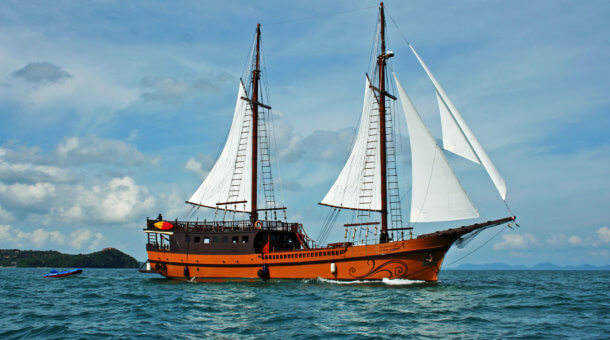 She was refurbished and converted into a liveaboard which started trips in late 2007. Giamani was refurbished again in 2015. Giamani accommodates a maximum of just 10 guests. We have found Giamani to be a quality boat offering great service. MV Giamani has a total of 5 cabins – 4 deluxe and 1 Master. The deluxe cabins are on the main deck and have en suite bathrooms. All the deluxe cabins have double beds and a bunk, so can be used for couples of as a twin cabin. The deluxe cabins are also available for triple booking. Good for parents with a kid. The Master cabin is on the upper deck and is the largest cabin on the boat. Also has an en suite bathroom. All cabins are air conditioned, all have seaview windows, and all bathrooms have hot water. The maximum number of guests is limited to just 10, with plenty of space for everyone to relax between dives. Considering many liveaboards take 20+ divers, to be on a good sized boat with just 10 divers is a definite plus. There are 2 common areas – an indoor salon with a library, TV, DVD player and music system, and also a spacious outdoor area, where meals are served. These areas are both on the upper deck. There is also a sundeck / relaxation area on the main deck at the bow. Food will be the usual delicious Thai cuisine, along with large hungry-diver breakfasts. Water supply is not a problem, as Giamani has 2 water-makers in addition to the large fresh water tank. 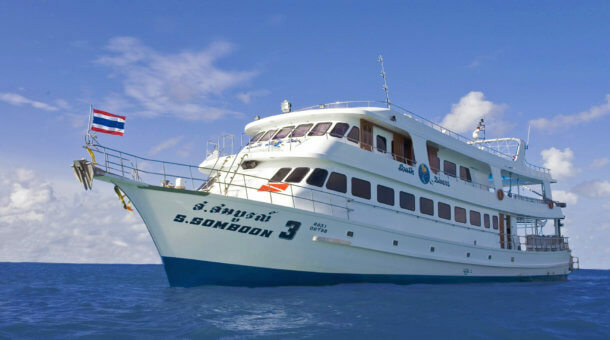 Rental equipment is provided by Sunrise Divers for our divers on the Giamani liveaboard. Rental price is 500 Baht per day for a set (BCD/regulator/fins/mask/wetsuit) and 250 Baht per day for a dive computer. We have a large equipment room at our dive center with 30 sets of Aqualung BCDs and regulators and a large selection of long and short wetsuits, open heel and full foot fins. Torches 100 Baht per day and 15 liter tank available 300 Baht per day. Nitrox is available on board @ 300 Baht per 12 liter tank fill, or 1,750 Baht for 2 day trips, 3,500 Baht for 4 day trips or 5,250 Baht for 6 day trips. PADI Advanced Open Water course is 8,500 Baht. PADI Enriched Air (Nitrox) course is 7,000 Baht. SSI or RAID Advanced Open Water course is 7,500 Baht. SSI or RAID Enriched Air (Nitrox) course is 5,500 Baht. Drinking water, coffee, tea, sodas included. Local beers are 80 Baht. Wine is 150 Baht per glass. 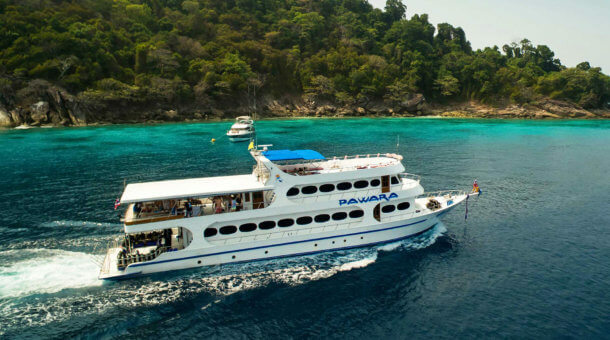 Giamani runs trips for 4 nights to the Similan Islands, Koh Bon, Koh Tachai and Richelieu Rock, 2 nights to Hin Daeng plus 6 night trips to the Mergui Archipelago in Myanmar. Note : This is an approximate itinerary. 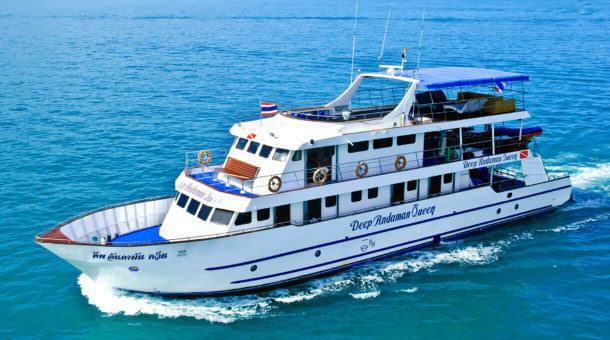 The 2 night trips include 7 dives at Hin Daeng, Hin Muang, Phi Phi and Koh Ha. Exact dive times will vary from day to day.